The Max Factory staff have been touring around Tokyo, Nagoya and Osaka to show off the popular Luka Megurine Tony ver. Prototype! Loads of people came to take a look, and the Max Factory staff looked delighted by the numbers! A big thank you to everyone who went down to take a look! But Luka was not the only figure on display! Can you see the figure with an arrow pointing to it? She is a figma from the anime series ‘Black Rock Shooter’ – a figma of Mato’s mysterious existence in the alternate world – Black Rock Shooter. Tonight is the final episode of the BRS anime! It is on Fuji TV’s Noitamina block, starting at 00:50!! Those who haven’t seen the first episodes can still catch them on Nico Nico Douga at any time! Kagari-chan’s personality is just to die for!! The most notable difference is the hood that she is wearing, however her clothes and weapons have also had a design overhaul, in order for the production team to have an even harder time customer’s to enjoy her more than ever before! The coat she is wearing is fitted with joints to make some incredibly dynamic poses! Her sword, the Black Blade! She is holding it in her left hand in this photo, but she can hold it in her right hand as well! BRS-chan is well known for being posed in epic poses like this, so I had to try it out with the figma! Even in such an amazing pose, you still can hardly see the joints at all! 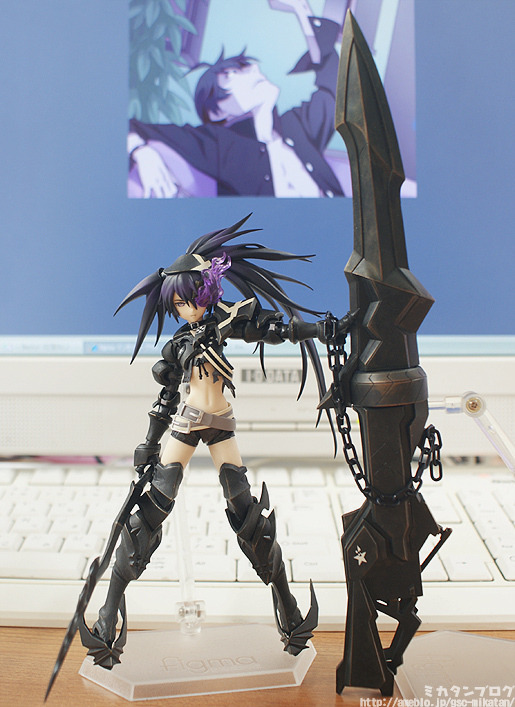 Plus she has extra head parts that allow you to pose her without the hood and with her twin-tailed hair instead! The Rock Cannon can open up! This recreates the way it worked in the series! It’s wonderful to see it on the figma as well! Plus, you can’t have BRS-chan without the blue flame! She has a replaceable fringe part that lets you pose her with the blue flame over her eye! The Tokyo International Anime Fair started today, and Good Smile has their very own booth at the event! Those who want to enjoy Golden Saw’s lovely underboob nice and close can come by the event and take a close look! 😛 There is a special Black Rock Shooter anime corner where all the new figures from the series are on display. ■ Place: Tokyo Big Sight, Tokyo International Exhibition Center Hall 1,2,3. ※ The 22nd and 23rd are for business related guests only. ※ No Good Smile Company limited edition products are on sale at the event. There will also be a lot of comments from people related to the series that you won’t be able to see anywhere else! They’re a very interesting read! If you have any preorder or sales queries, be sure to contact our customer shops! And don’t forget! Tonight is the last episode of BRS! Fuji TV’s Noitamina block, starting at 00:50! !